Looking for a guest friendly hotel with high ratings from previous guests? The hotels listed below are confirmed to be 100% guest friendly and all have high review scores (at least 8+ out of 10) from previous guests. To check the rates for any hotel, click the “Check current room rates and availability” link next to the hotel name and description. 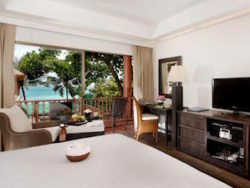 Kata The Boathouse Phuket is a lovely four star hotel located right on Kata Beach, with direct access to the beachfront. Rooms here range comfortable sea view rooms to a luxurious penthouse suite. Facilities include a beachside swimming pool, pool bar, coffee shop and beachfront restaurant. 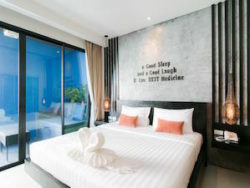 Overall, one of the best four star hotels in the Kata area and a much more cost effective option than the bigger luxury hotels in this part of Phuket. 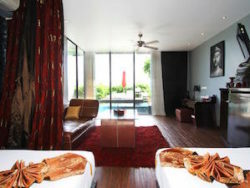 Patong The best luxury guest friendly accommodation close to Patong. IndoChine Resort & Villas is located about 10 minutes north of Patong by tuk-tuk, giving you all of the privacy and peace of a remote resort while still being close to the action. From the resort, it's fast, cheap and easy to get into Patong to enjoy the nightlife. Thanks to the secluded location, IndoChine offers amazing views over Patong Beach and the surrounding area. There's beachside dining, an outdoor pool with great views, and high-end facilities. This is a true five star resort with amazing facilities, ranging from private villas to exclusive suites and ocean view residences. IndoChine is 100% guest friendly, with no extra fees for joiners. Kata Located up the hill from Kata Beach, Boomerang Village Resort has spacious rooms with great views over the beach. Add a garden environment and great swimming pool into the equation and this is one of the best resorts in the Kata area. Since the resort is a decent distance from the beach, you'll want your own scooter if you're staying here. All in all, a good option if you're in Phuket for a week or longer and want a break from the hustle and bustle of Patong. Summer Breeze Hotel Patong A great option in Patong, Summer Breeze Guesthouse has one of the best locations in Phuket for nightlife access. This hotel is located on Soi Sansabai, less than two minutes away from Soi Bangla on foot. This means you have all of Phuket's best bars, clubs and other entertainment options within a couple of minutes of leaving the hotel. It's also a two minute walk to Jungceylon Shopping Mall, meaning you can easily access the shopping and food options nearby. Despite the location, Summer Breeze Guesthouse is quiet at night, making it easy to get a full night's sleep. The rooms are large, comfortably decorated and provide everything you'll need for a nice stay. Add great pricing into the equation and this hotel is hard to beat. Patong Rated 8.2 out of 10 by guests, Absolute Guesthouse is one of the highest rated mid-priced guest friendly hotels in Patong. This hotel has a quiet, peaceful location off Nanai Road, making it less than five minutes from Bangla by tuk-tuk. It takes about five minutes to walk from the hotel to Patong's nightlife, or 10 minutes to get to the heart of Bangla. The biggest benefit of this hotel is the value for money offered. Rooms here are large, nicely furnished and very clean. There's no view, but the overall experience is great. Every room has a small balcony that's perfect for relaxing during the daytime. The House Patong Hotel Patong The House Patong Hotel is a small, extremely modern hotel located 5-10 minutes (depending on your walking speed) from the nightlife on Bangla Road. The hotel is surrounded by restaurants and cafes, making it a convenient place to be during the day. Thanks to the location near but not directly in the nightlife, The House is quiet and peaceful after dark, making it a great place to sleep. The rooms are almost brand new and decorated with huge beds and stylish furniture. Some even have sofa-style seating outside, letting you relax on the balcony during the day. 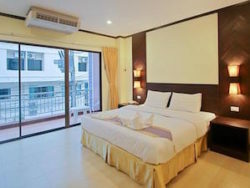 K Hotel Patong K Hotel is one of the best mid-priced guest friendly hotels in Patong. This hotel is located less than five minutes' walk from Bangla Road and Patong's main nightlife area, but still offers a peaceful, quiet atmosphere that makes it a great place to stay. It's also clean, comfortable and modern, with spacious rooms and a relaxing, garden-like atmosphere. There's a swimming pool surrounded by greenery, beautiful gardens and a peaceful vibe that will almost make you forget you're in the middle of Patong. Jinny Guesthouse Patong Jinny Guesthouse is a small, affordable guesthouse located about 10 minutes outside the center of Patong by tuk-tuk or scooter. This is easily one of the best budget hotels in Patong, although the location means you'll need to rent a scooter to get around. Baan Orchid Guesthouse Patong Beach Patong Another good budget option, Orchid Guesthouse is a 10 minute walk away from Bangla, Patong's main bar and nightlife area. The units here are clean and comfortable, with separate living areas for you to relax in. Despite being called a guesthouse, Baan Orchid has more of a resort feeling, with a garden atmosphere that makes it a relaxing place to stay. Patong Located on Soi Baanzan, Presley Guesthouse is a five to 10 minute walk away from Bangla Road, making it one of the best budget accommodation options in Patong if you want to be close to the nightlife. As you'd expect from the name, Presley Guesthouse has an Elvis theme, with plenty of photographs and paintings of The King throughout the hotel. There's also a small bar downstairs with friends staff that are always keen to chat and provide tips on enjoying your stay in Patong. Rooms here are simple but clean and more than comfortable, with large beds and enough space for you to stretch out and relax. All in all, a great budget accommodation option and one of the most conveniently located budget guest friendly hotels in Patong. GuestFriendlyPhuket.com is a participant in the Agoda Partners program. We may receive a commission for purchases made through this website. © 2019 Copyright Guest Friendly Hotels in Phuket. All Rights Reserved.